Digestive enzymes are naturally present in raw foods but are destroyed by cooking and processing, meaning our modern diets tend to be very low in these critical nutrients. Fortunately our own bodies produce digestive enzymes for us, but sadly as we age this production diminishes. As a result, poor digestion and food intolerances can start to occur. This is where digestive enzyme supplements are so helpful - we can orally supplement with them to correct these imbalances. Studies have shown that supplementing your diet with the right enzyme supplements can result in notably improved digestive health. However, not all digestive supplements are created equal. The vast majority of digestive enzymes on UK shelves are seriously underpowered, under-dosed and often even mislabelled (not even using the correct units of measurement). We stock only the most potent and effective enzyme supplements. Our wide range of digestive enzymes comprises not only of products for general digestive health but also those that target specific issues such as dairy or gluten intolerance, yeast infections and much more. Not sure where to start? We highly recommend Digest Gold as a great jumping off point for improving digestion. 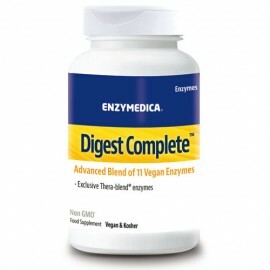 The Best Fish Oil Supports Your MicrobiomeHelp support your microbiomeThe Microbiome is the microbia..
Enzymedica Acid Soothe™ contains enzymes, papaya leaf and other botanicals to support optimal digest..
Digestive enzymes like amylase, cellulase and lipase help to support digestion of foods that may cau..
Enzyedica Allerase contains an enzyme blend that supports the body’s natural ability to identify and.. The Power of NatureApple Cider Vinegar (ACV) is a traditional folk remedy that has been shown to sup..
Berberine is an alkaloid found in many plants, but most notably in goldenseal (Hydrastis canadensis)..